BSF SI Recruitment 2018: Latest BSF SI Recruitment Advertisement has been depicted by officials of Border Security Force for 224 Group-B Vacancy. All those contenders who are interested and want to part of the primary border guarding force of India can grab this opportunity by applying for BSF SI Recruitment 2018. Contenders who have decided to apply for BSF Sub Inspector Group-B Recruitment need to submit their BSF SI Recruitment Form till the last date that is 26-10-2018. Candidates are advised to send their applications for BSF Sub Inspector Vacancies along with all enclosures/ certificates within given period. 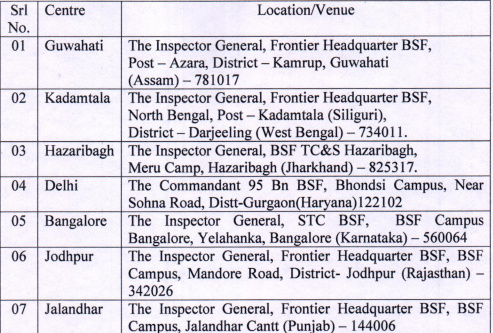 To apply for BSF Sub Inspector Jobs, candidates should be Serving as BSF Constables, Head Constable, ASI & Tradesmen. However for further educational qualification details, candidates can see the detailed BSF Sub Inspector Recruitment Advertisement. Candidate’s age should not exceed 32 years in age to fill application form for Border Security Force Jobs. Relaxation in age will be granted to reserved category candidates as per the norms of organization for BSF SI Group-B Vacancy. According to BSF Sub Inspector Salary structure, selected candidates for BSF SI Recruitment will get Rs. 35400-112400/- as monthly income from the concerned department of organization. All the applying contenders for BSF Sub Inspector Recruitment 2018 will have to appear in Written Test, Physical Test & Medical Exam organized by the experts of organization. It is an objective types multiple choice question paper. Entire question paper is of 200 marks. Duration of BSF Exam is 3.5 hours. From home page, move your cursor under “Recruitment” head for BSF Bharti. 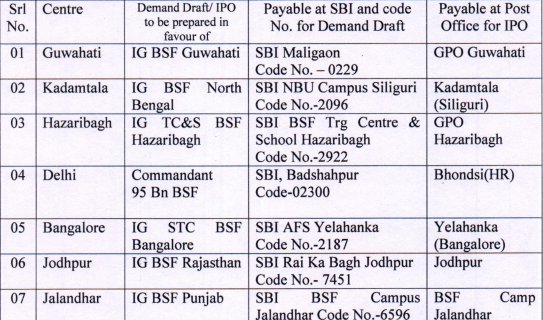 Various BSF Notifications will be displayed you need to choose suitable link regarding BSF SI Bharti. From new window you need to follow “BSF L/No. A.8/SI(LDCE) Exam-2018-19/Pers(Rectt)/BSF/2018/7514-7864” link and press on “Selection of Sub-Inspector (GD) through Limited Departmental Competitive Examination 2018-19” link to get Official PDF of BSF SI Notification. Now, BSF SI Advertisement will open up at your screen, read it carefully. After reading BSF SI Recruitment PDF download format of BSF SI Application Form and take a print out of it. Enter all necessary details in BSF Recruitment Form for BSF Sub Inspector Recruitment. Attach all required copies of certificates along with BSF Sub Inspector Recruitment Form. Now, you may cover and super scribed in bold letters” APPLICATION FOR THE POST OF …………………..”. At last, you are required to send BSF Recruitment Form at postal address mentioned below. To get rest of details about BSF SI Recruitment 2018 - 19, you must go through the Official Link. Feel free to share your queries with us by drop your comment in comment box; our experts of www.privatejobshub.in will respond it as soon as possible. BSF SI Recruitment 2018: Directorate General of Border Security Force is going to conduct All India Examination for BSF SI Recruitment. Through Border Security Force Recruitment Notification, the organizations will Bharti eligible candidates at 103 Group-B Vacancies. Interested applicants can fill BSF SI Application Form on or before the last date that is 01-10-2018. Only those applicants who satisfy eligibility norms can apply for BSF SI Recruitment 2018. BSF will hold and All India Examination to hire eligible candidates at SUB Inspector (WORKS) Group ‘B’, Non- Gazetted Non Ministerial Engineering (Civil) (Combatized) in Border Security Force. Applicants who are seeking for further details of BSF SI Recruitment 2018-19, they can go through below section of this page which is well created by the team members of www.privatejobshub.in. Candidates who are going to apply for BSF SI Vacancies shall completed Diploma in Civil Engineering or equivalent from a recognized Institute. Age Limit of the candidates applying for BSF SI Group-B Vacancies shall not exceed 30 Years. The BSF offers a pay scale to its employees selected through BSF SI Group B Recruitment 2018 Rs.35,400- Rs.1,12,400. Along with the monthly pay scale, candidates will also be given other benefits. Firstly candidates will be shortlisted through Physical Efficiency Test, Physical Standard Test . After that they have to undergo for first Phase of Examination, second phase of examination, third phase of examination. It will consist of two papers. First paper is of objective type basis with duration of 01 hour 30 minutes. Questions will be asked from General Intelligence and Reasoning, General Awareness and General Engineering. Second Paper is of 02 Hours (Conventional Type). Questions will be asked from General Engineering Civil. After qualifying First Phase of Examination, shortlisted candidates will be called for Second Phase of Examination which includes Documentation, Physical Efficiency Test, and Physical Standards Test. Those candidates who will qualify both (first and second Phase of Examination) then will have to appear for Third Phase of Examination which includes Practical Test and Medical Examination. How to Apply for the BSF SI Recruitment 2018? Aspirants applying for the Border Security Force Recruitment they should follow the given steps on this page to fill BSF SI Recruitment Application Form, please have a look..!! Candidates can get the complete details regarding BSF SI Recruitment 2018-19 from this page; if you want to know more about Border Security Force ASI Recruitment then you can check the Official Link.